The new SoundCloud Go is reminiscent of what Spotify and Tidal offer, though the company's music offerings are vastly limited in comparison. SoundCloud is jumping into the crowded subscription music-streaming market, where Spotify, Apple Music, Pandora, Tidal, YouTube Music, and others are already struggling to turn a profit. SoundCloud Go costs $10 per month and is available now through an app update for Android and iOS devices. This new subscription service includes ad-free listening and the ability to enjoy your favorite music offline—a marquee feature considering SoundCloud was essentially streaming-only for the longest time. SoundCloud Go offers unlimited streaming for $10 per month, though most of the songs you’ll find are from indie artists. 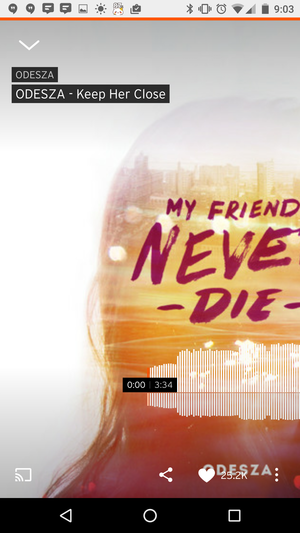 Along with its new subscription service, SoundCloud has also revealed an expanded library, made possible through a newly formed relationship with the last of the three major record labels, Sony Music. Now you can find mixes from your favorite hometown DJs alongside all the big-name artists, like Rihanna. You can only hear those top-tier artists if you subscribe to SoundCloud Go, however, but the upside is that you’ll have access to exclusive mixes that you won’t find even on Tidal—like this one from Kanye. There is a major caveat to all of this: SoundCloud advertises an expansive music library of 125 million songs, but 110 million of those are user-uploaded tracks, with the remaining 15 million songs from major artists. That’s about half of what bigger services such as Spotify and Tidal offer. You’ll definitely notice the difference if you try to find full albums from your favorite Top 40 artists. 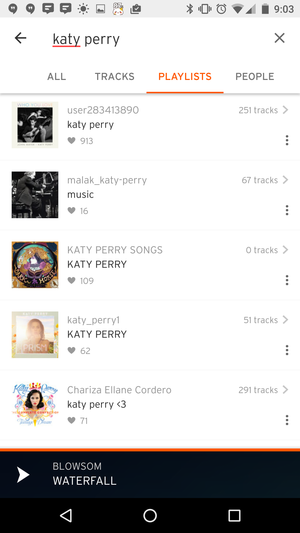 When I searched for Katy Perry, for example, I found only her album uploaded by a fan, rather than her actual SoundCloud profile. Katy Perry doesn’t have much of a presence on SoundCloud, despite the fact that she was the highest paid pop star in 2015. The story behind the story: While it’s true that SoundCloud is offering something different than the competition, it’s hard to imagine large numbers of people paying a monthly fee just to get all the mixes they can eat—it’s a niche within a niche. If you’re curious to try out SoundCloud Go for yourself, the company is offering a 30-day free trial for both Android and iOS users. As a longtime SoundCloud user myself, I’m curious to experience whether it’s worth the monthly fee, and I’ll be following up with a full-blown review of the Android app in the coming weeks.